First of all, let’s consider the toothbrush you use. We recommend a brush with soft bristles. Hard bristles may feel like they’re doing a better job, but the truth is they can scratch the enamel on your teeth. Likewise, if you use an electric toothbrush, make sure the rotating heads have soft bristles. Next, and despite what commercials and advertisements promote, you really only need a pea-sized amount of toothpaste on your brush. In fact, too much toothpaste generates so much foam, you probably won’t be able to keep all of it in your mouth anyway. Dampen the toothpaste and get ready to brush. When you brush, it’s best to hold the bristles along your gum line at a 45 degree angle. This way, the brush is in contact with both the surface of the tooth you’re brushing, as well as the gum. You can brush two or three teeth at a time, moving the brush in a circular and rolling motion, so you’ll be sure to cover the entire surface of the tooth. Pay particularly close attention to the inner surfaces of your teeth where plaque is more likely to accumulate. Brush up and down along the insides of your front teeth and back and forth along the chewing surfaces of your back teeth. Finally, brush your tongue from back to front to remove bacteria. 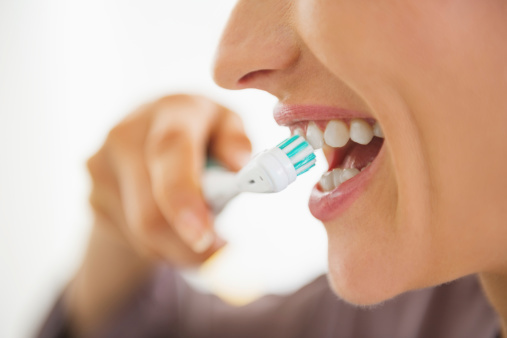 Effective brushing should take about two or three minutes. And for the sake of your oral health as well as your general health, be sure to replace your toothbrush every three months. For more pointers on how to brush, or to schedule one of your regular dental cleanings and exams, contact the dentist Brookfield, WI, trusts, Elmbrook Family Dental. We also serve the surrounding communities of New Berlin, West Allis, Pewaukee, Wauwatosa and beyond.